Food allergies account for about 10% of all the allergies seen in dogs and cats. It is the third most common cause after flea bite allergies and atopy (inhalant allergies). With the advent of lamb and rice diets many people feel that they are preventing or treating food allergies. The fact is that nothing could be farther from the truth. The entire process of a pet being sensitized to a particular agent in food and the complicated antibody response that occurs in the intestinal tract in pets with food allergies are not very well understood. Despite our lack of understanding of the actual disease process, there are many things that we do know including the symptoms, how to diagnose food allergies, and also how to treat them. Food allergies affect both dogs and cats. Unlike atopy, there is no strong link between specific breeds and food allergies. Food allergies affect both males and females and neutered and intact animals equally. They can show up as early as five months and as late as 12 years of age, though the vast majority of cases occur between 2 and 6 years. Many animals with food allergies also have concurrent inhalant or contact allergies. Several studies have shown that some ingredients are more likely to cause food allergies than others. In order of the most common offenders in dogs are beef, dairy products, chicken, wheat, chicken eggs, corn, and soy. As you may have noticed, the most common offenders are the most common ingredients in dog foods. This correlation is not a coincidence. While some proteins might be slightly more antigenic than others, many proteins are similar in form and the incidence of allergic reactions are probably associated with the amount of exposure. For example, pet foods have historically been made up of beef, chicken, corn, and wheat. In an effort to combat food allergies, several companies produced a diet made of lamb and rice. There was nothing special about lamb and rice diets except those two ingredients were normally not present in pet foods. Animals had not eaten lamb or rice before, and therefore, had not developed an allergy to it yet. If the main ingredients in pet food become lamb and rice, then it would stand to reason that the most common problem foods could become lamb and rice. The determinant of whether a food is likely to cause a food allergy or not is based on the structure and size of the glycoprotein in the food. In addition, many lamb and rice-based foods contain many other ingredients, and if the animal has a food allergy to any of them, this lamb and rice food will do nothing to treat the food allergy. In addition, while many people criticized and blamed preservatives and flavorings as a source of food allergies, studies have shown that they are not the causes, and while we may not have justifiable health concerns about preservatives, food allergies is not one of them. The symptoms of food allergies are similar to those of most allergies seen in dogs and cats. The primary symptom is itchy skin. Symptoms may also include chronic or recurrent ear infections, hair loss, excessive scratching, hot spots, and skin infections that respond to antibiotics but reoccur after antibiotics are discontinued. There is evidence that dogs with food allergies may sometimes have an increased incidence of bowel movements. One study showed that non-allergic dogs have around 1.5 bowel movements per day where some dogs with food allergies may have 3 or more per day. Elimination diets and provocative testing: A food trial consists of feeding an animal a novel food source of protein and carbohydrate for 12 weeks. A novel food source would be a protein and carbohydrate that the animal had never eaten before. An example would be rabbit and rice, or venison and potato, or duck and rutabagas. These are homemade diets but there are several commercial diets available on the market. Special Foods produced by Hill's and Purina, and a food named EXclude are used by many dermatologists. Regardless of the diet used, it must be the only thing the animal eats for 12 weeks. This means no treats; absolutely nothing but the special food and water. Young growing pets have special dietary needs and a homemade diet that only contains one protein and one carbohydrate with no multivitamin or fatty acid may not be suitable even for only twelve weeks. 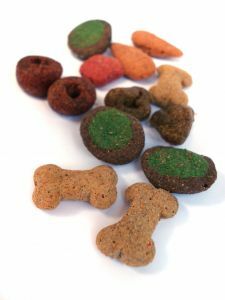 For puppies undergoing a food trial, a balanced commercial diet like the ones listed above is recommended. The only way to accurately diagnose food allergies is with a food trial as detailed above. While the intradermal skin testing is excellent for diagnosing atopy (inhalant allergies) it is ineffective for food allergies. While the ELISA and to a lesser extent the RAST test can be used to help in the diagnosis of atopy, they have no benefit in diagnosing food allergies. In our review of all the current books and articles on veterinary dermatology and allergies, we could not find a single dermatologist that endorsed anything other than the food trial as an effective diagnostic aid. If you want to diagnose and treat food allergies you must do a food trial.